Sorting of diamonds. Photo by Alrosa. Russia’s government wants state-owned Alrosa (MCX:ALRS) to offer more favorable terms to local cutters so they are able to compete in a market that’s dominated by Indian manufacturers. 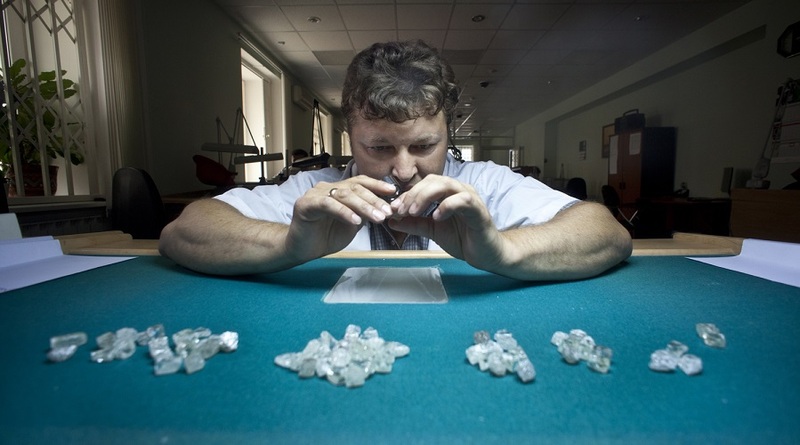 In an interview with Bloomberg, Deputy Finance Minister Alexey Moiseev said that the Putin administration would like for Alrosa -which is the world’s top diamond producer by output in carats- to sell about 10 per cent of its gems domestically. Even though Alrosa would keep its market prices, the idea is that it offers Russian cutters the possibility of not buying the whole contracted volume or only choosing certain stones and returning the rest. “Cooperation currently is rather limited and it has to expand,” Moiseev noted. Kristall Production Corp., the country’s largest cutter, and other smaller companies buy stones from Alrosa at similar terms to those set for foreign companies. This has created a difficult situation for them, having to compete with larger polishing centres like those in India that currently process about 90 per cent of the world’s diamonds by employing a workforce of 1 million people. According to Moiseev, Moscow’s official programme to boost the diamond industry also involves the softening of excessive controls for importing and exporting gems, as well introducing regulation identifying the origin of diamonds to make the market more transparent.